It’s hard not to resist making fun of all of our worries about the H1N1 flu virus (even if it does concern me, given the germs that linger in my classroom). What Makes Cylene the Cyborg Tick? 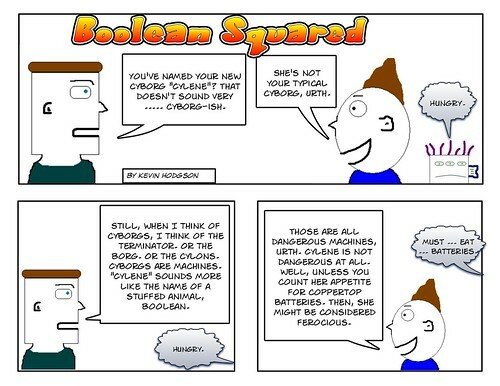 So, how did Boolean build his new friend, Cylene the cyborg? By sifting through the remains of his spyware and virus software, of course. I imagine few younger people will get the reference to The Honeymooners, but I could not resist. What a name — Exquisite Corpse — and just that name alone got my students thinking and writing yesterday. The Exquisite Corpse is an activity in which one person starts a piece of writing (or artwork), and passes it (the corpse) along to the next person, who adds to it and then passes it along. The end result is a fascinating hodgepodge of creative energy and often bizarre offshoots from the original idea. Yesterday, we talked about this concept and then read aloud together the first ebook installment of an Exquisite Corpse story that has been started by author Jon Scieszka, the National Ambassador for Young People’s Literature and famous for his Stinky Cheeseman stories (ask any kid, they’ll tell you), and which will be added to every two weeks by famous authors — such as Katherine Paterson, Natalie Babbit, Steven Kellogg and more — over the next year (yep — a year long novel writing project published online in a flash format). My students were fascinated by the myriad of clues (a wonderful lesson in foreshadowing, by the way) left by Scieszka in the first chapter as twin siblings Joe and Nancy (not their real names, they will soon find out) are on a train (with dynamite on the bridge ahead) trying to rescue their parents by solving clues. Oh and along the way, they will meet such things as a monkey dressed as a pirate, mad scientists, two meatballs, a roller-skating baby and Star Wars lunchbox, plus much more mayhem. How in the world the story will unfold will be interesting to watch. We used Scieszka’s first chapter for our own short story writing in class yesterday, continuing the adventure along. There are many twists and turns (one story featured talking meatballs, another had aliens from another time dimension) and my hope that when we read the next chapter next week, we can discuss why the author (Katherine Paterson) did what she will do with her writing. 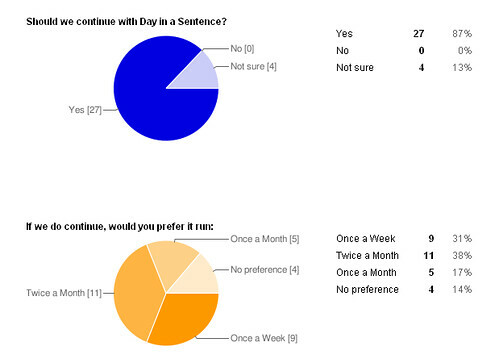 Yesterday, my review of a book in a really engaging graphic novel series finally hit the page at The Graphic Classroom. It revolves around a series of graphic novels called Max Axiom, who goes on adventures around scientific themes. Capstone Press, which publishes the books, also just put out a new series in which a character — Isabel Soto — goes on historical-based adventures (I sent in a review of The Great Wall of China). 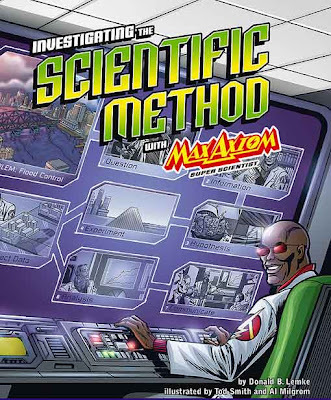 As part of my review, I interviewed my fellow teacher — Lisa Rice — about using the Max Axiom graphic novel in her classroom as she was teaching our students about the Scientific Method. Lisa loved the idea and I think the use of these graphic novels opens the door to comprehension for some students (not all, perhaps). Boolean explains why he named his new pet cyborg Cylene to his friend, Urth. 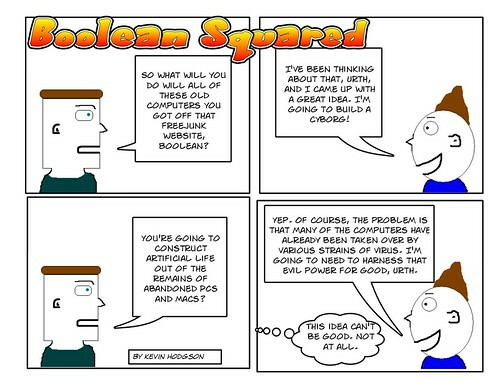 So, here is my new character which Boolean built out of old abandoned computers that he has gotten off a site called Freejunk.. More strips are coming with her in it. Actually, in the early days of Boolean Squared, Funk the llama was an alien from outer space who crash-landed on Boolean’s lawn. But, I decided to move away from that idea and made Funk a llama who loves the music of James Brown (I still like that idea). I guess I have slightly resurrected an early idea of Funk with Boolean’s new cyborg. I think she is cute. 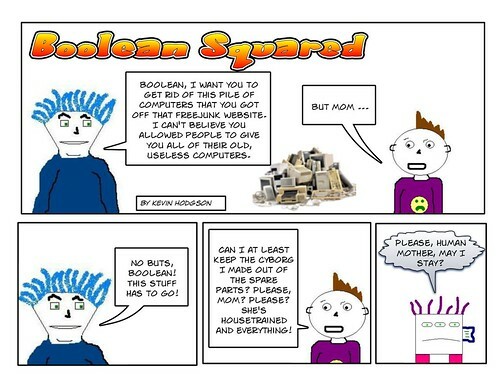 Here is my third installment of Boolean Squared as Boolean culls through a pile of old computers to begin building his own cyborg. Dangerous, you say? Perhaps. But comics are all about danger. Wait until you see what he constructs from the carcasses of discarded computers.